Devaris Frederick of Hollywood FL. This photo is from the FDLE offender database. A wild incident took place on Saturday at the Sandalfoot Publix here in West Boca Raton. Devaris Frederick of Hollywood Florida allegedly stole a woman’s purse while in the line waiting to pay the cashier. He ran out of the store and into a waiting U-Haul van. Comically as the van drove off, witnesses say Frederick fell out of the back door of the van. Narrative from the PBSO probable cause affidavit. We redacted the victim’s name. 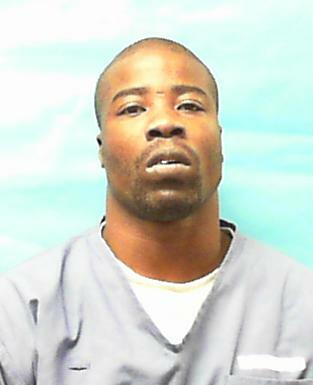 Witnesses then chased Frederick, tackled him, and held him down until deputies from the Palm Beach Sheriff’s Office arrived. Deputies also found a crack pipe in Frederick’s possession, but no lingerie. FDLE records indicate Frederick has a substantial criminal history including two lengthy stays in some of the finest all-inclusive resorts the State of Florida has to offer. 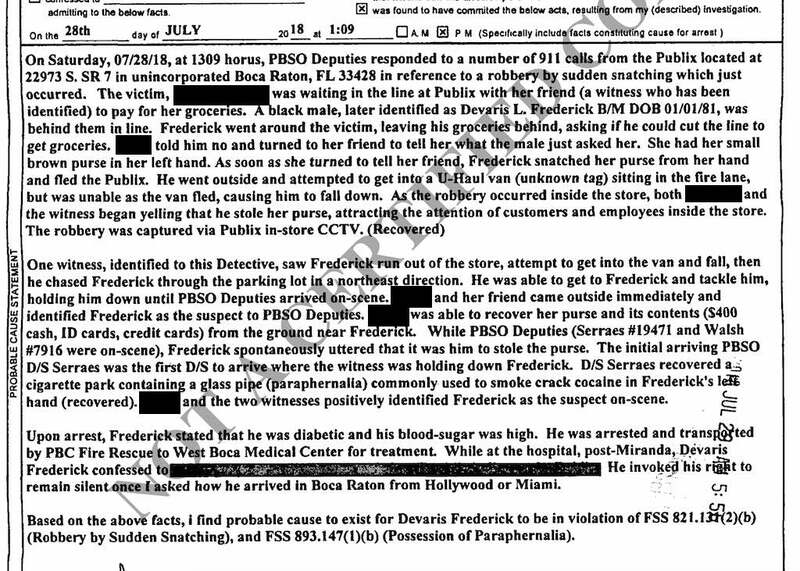 Broward County court records reveal Frederick had just been released from jail on a pending felony grand theft charge with an electronic monitoring agreement that means he should have had a GPS device on his ankle. It was not mentioned in the probable cause affidavit. He may be returning to a state prison in the near future. We are hoping to get video from this incident, either from PBSO or possibly from locals who were reportedly recording on scene. Broward Sheriff’s Office traffic homicide investigators have arrested a Boca Raton woman who killed her passenger in a single-vehicle crash on Mother’s Day in Parkland. Laura Haggerty, 47, was taken into custody Sept. 30 with the help of the Palm Beach Sheriff’s Office. She faces two DUI/Manslaughter charges and one charge of vehicular homicide. Around 4 p.m. May 8, Kelly Rider, 35, was a passenger in a Ford Explorer that was heading eastbound on Loxahatchee Road. Laura Haggerty was behind the wheel. Haggerty lost control of the vehicle near the 12200 block when her SUV drifted off the road. Haggerty overcorrected, causing the vehicle to veer across the roadway and collide with the guardrail on the north side of the street. The SUV then began to spin in a counterclockwise motion, before rolling over. Rider, who wasn’t wearing a seatbelt, was ejected. Coral Springs Fire Department pronounced him dead at the scene. BSO Air Rescue transported Haggerty to Broward Health North. According to BSO detectives, she was speeding and driving with a blood alcohol content of 0.25. The BSO report indicates that both Haggery and Rider lived at the same address on Sailfish Road in Watergate Estates, just north of the west stretch of Sandalfoot Blvd. Photo of Rider and Haggerty from Rider’s Facebook page. Previous mugshots of Gary (Garry) Pierre from Palm Beach and Broward. The Palm Beach Sheriff announced today that they have arrested Gary Pierre (aka Garry Pierre) for the murder of Christo “Sto” Maccius. We previously reported that Maccius, a West Boca High teacher and alumnus, was shot and killed in Sandalfoot Square. 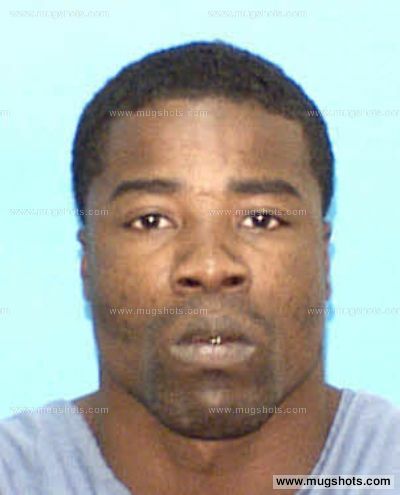 Pierre has a lengthy criminal history in both Palm Beach and Broward including three felony arrests in Palm Beach. In 2012 he was arrested for robbery with a weapon. That charge was dropped by prosecutors. In 2007 and 2009 he faced felony drug charges. Broward courts show multiple drug felonies along with a grand theft charge. Those are just the felonies. He has also had several misdemeanor cases, criminal traffic cases and traffic violations. The most recent address we see for Pierre is in Coral Springs. We have seen other addresses for him in North Broward as well as in Sandalfoot Cove near Boca Dunes. He was a substitute and shadow for children with special needs. The shooting happened in or near the Sandalfoot Square plaza and O’Connor’s Pub. The Palm Beach Post has ongoing updates on the story, including resident concerns about high crime and a report that the shooter had a long-standing grudge against Maccius. Last year we reported on another shooting at or near the same location. All photos are from Facebook messages, comments, or pages. From what we can see on Facebook and other sources Maccius had many friends in the community, and will be missed. We reached out to both PBSO and the school for more information but so far have not received any response. As of this moment we believe the shooter has not been caught. We do not have any identity yet either. Warning: The photo below may be disturbing to some readers. Do not scroll down if you are sensitive to such things. And please note that many of the negative comments posted on this article (below) appear to be “trolling.” Some have been deleted and/or blocked from future comments.